The President and the EU leaders will discuss "the global economy; our efforts to strengthen economic ties and growth; our joint work to support democracy and prosperity in the European neighborhood, across the Middle East and North Africa, and in other regions; our continuing coordination on Iran; and our commitment to improved transatlantic law enforcement and counterterrorism cooperation," the White House said. 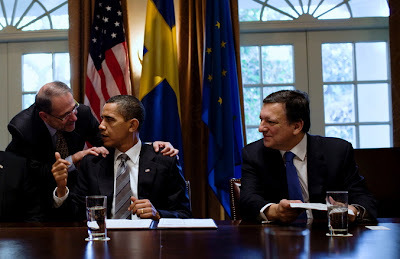 After the luncheon, at 1:40 PM in the Roosevelt Room, President Obama, European Council President Herman Van Rompuy, and European Commission President José Manuel Barroso will deliver statements to the press. *Photo by Pete Souza/White House, taken on Nov. 3, 2009 in the Cabinet Room. read more "Today: President Hosts EU Summit & Luncheon"
First Lady Michelle Obama will give the keynote address on Wednesday morning at Partnership for a Healthier America's (PHA) Building a Healthier Future Summit. The two-day event in Washington, DC, is the first national summit hosted by the non-profit foundation established to further Mrs. Obama's Let's Move! campaign, and will bring together business and industry leaders with their nonprofit, academic, and government counterparts for panel meetings and discussions. It begins on Tuesday morning at the Omni Shoreham Hotel. Mrs. Obama serves as honorary chair of PHA, which is led by Dr. James R. Gavin III. The foundation is responsible for organizing and managing the private-sector commitments the First Lady has garnered for the Let's Move! campaign, including the pledges from Walmart and other grocers to build stores in food deserts, and from national chain Darden Restaurants to revamp its menu offerings. At the summit, "private sector leaders from all industries will be announcing new commitments while current PHA partners will be proving updates on their progress," according to organizers. Honorary vice-chairs Mayor Cory Booker of Newark, NJ and former U.S. Senate Majority Leader Bill Frist, M.D., will both speak at the summit, as will Gavin. A dinner on Tuesday night for all Summit attendees will be cooked by James Beard Award winners and nominees Floyd Cardoz, Koren Grieveson, Michel Nischan and Anne Quatrano. Social media: PHA's website is here; a Facebook page for the summit is here; Twitter is @PHANews with the hashtag #PHASummit. 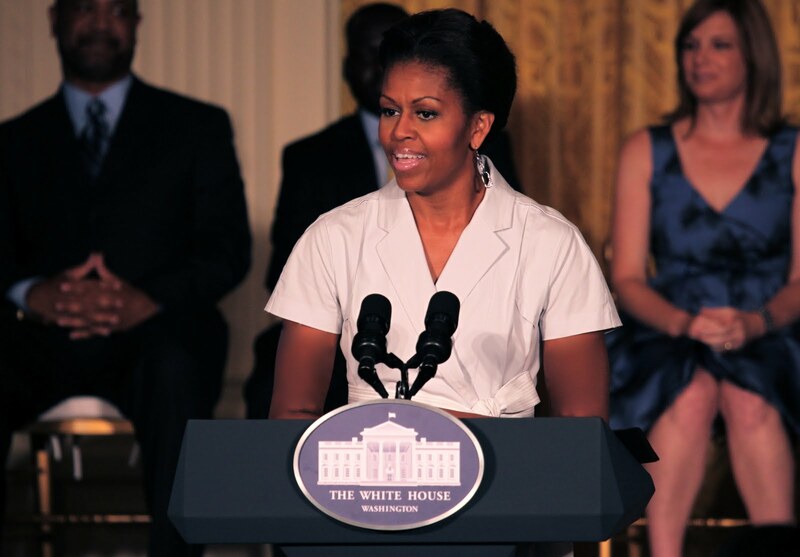 Check out @LetsMove and Letsmove.gov for the First Lady's campaign. read more "First Lady To Keynote "Building A Healthier Future" Summit"
On Wednesday, Nov. 30th, as she unveils the decorations for her third holiday season in the White House, First Lady Michelle Obama will welcome military families, including Gold Star and Blue Star parents, spouses and children, for the first viewing. At 1:30 PM, Mrs. Obama will deliver remarks in the East Room, and then she will host the children in the State Dining Room for a special holiday craft and treat session. Two White House Christmas Trees will honor military families this year. Last Friday, Mrs. Obama was presented with the Official White House Christmas Tree, and the 19-foot-tall Balsam Fir, grown in Wisconsin, will be placed in the Blue Room, and decorated with a theme honoring Blue Star families. A special Gold Star Christmas tree decorated by Gold Star families will be displayed at the visitor’s entrance on the East Wing Landing. As many as 100,000 visitors will view the White House holiday decorations in the next month, according to an aide. In 2009, Mrs. Obama's first holiday theme was "Reflect, Rejoice, Renew." In 2010, the theme was "Simple Gifts." Both themes were inspired in part by the First Lady's Kitchen Garden, and made liberal use of fruit and dried vegetables, woven among the more traditional greens. 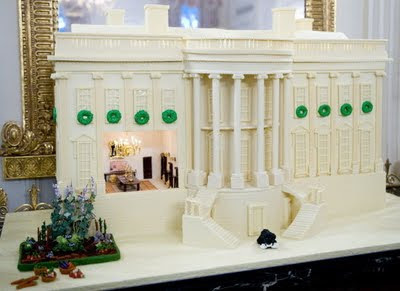 read more "Wednesday: First Lady Will Unveil 2011 White House Holiday Decorations"
President Obama this week announced the third "Dinner with Barack" contest to raise money for his 2012 re-election war chest. To build interest among donors, Obama for America released five new videos from inside the first contest dinner President Obama has completed, his meal on Oct. 27 at Liberty Tavern in Arlington, Virginia. The President's press pool was allowed into the dining room for less than one minute during the event for a rapid photo op, so the Campaign videos are the first extended look at what occurred as four "everyday Americans" broke bread with the Commander in Chief. The longest video is more than eight minutes long, and edited like a feature film. (Above, the President with from L Knight, Smith, Helbling, and Martinez). The winners were Juanita Martinez, a retired teacher from Brighton, Colorado; Casey Helbling, a software entrepreneur and small-business owner from Minneapolis, Minn.; Ken Knight, a U.S. postal worker from Chandler, Arizona; and Wendi Smith, a retired professor and artist from Corydon, Indiana. Helbling is such a huge Obama supporter he named one of his children "Maxwell Barack," he revealed after the dinner. All had to sign documents agreeing to be used--without pay--in campaign materials. Each prize, taxable by the IRS, was valued at $1,075, and included air fare to DC and a one-night hotel stay for the guests. The prizes did not include make up and hair service for the winners, as they made their feature film debuts. The dinner was just 70 minutes long; the guests declined the President's offer of dessert. The longest mini-movie, above, is titled "Dinner With Barack: Two Teachers, an Army Veteran, a Small Business Owner and The President." 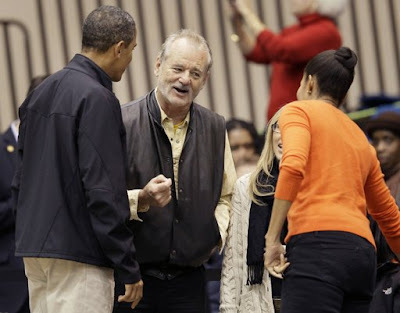 It's edited to build excitement, and shows the President's guests arriving in Washington and being wowed by the monuments, while discussing their thrill over the upcoming dinner with Mr. Obama. Then it transitions to the restaurant, and shows edited portions of the Presidential mealtime conversation. The other four videos are shorter vignettes of the table talk, edited by theme. For the record, the President at dinner enjoyed the "Harpoon Caught Swordfish," which is regularly featured on The Liberty Tavern menu. It's served "Portuguese style," with white beans, sweet peppers, lamb sausage escarole, and Littleneck clam sauce ($22). He washed it down with iced tea, though his companions drank wine. Before this week's video releases, the four winners had previously dished about their dinner to various media outlets, as well as put out statements for Campaign HQ. Above, in this 1:05-long clip, "Dinner With Barack: The Impact of My Father," the President is asked by one of his guests about the "negative impact" of not knowing his father, who left when he was a small child. It's the most moving of the videos. "As I look back on my life, I only remember my father for one month of my whole life," President Obama said. "When I was ten." His father, however, introduced him to all the things he became passionate about, the President said--among these basketball and jazz--and the absence made him realize how important it is to be a good father to daughters Malia and Sasha. Above, in the 1:04-long "Dinner With Barack: A Typical Day," Mr. Obama discusses what might occur on any given day of the Presidency. The days are "packed," the President said, noting that he's "not a morning person." The last time he was awakened in the middle of the night for an emergency was for the Japan earthquake and tsunami, the President said, "probably around 3 in the morning." "At 6:30, even if I'm really busy, I'll stop, go upstairs, and have dinner with the girls," the President said. Above, in the 1:02-long "Dinner With Barack: Why Education Is important," the President and his guests discuss education issues, as the title implies. 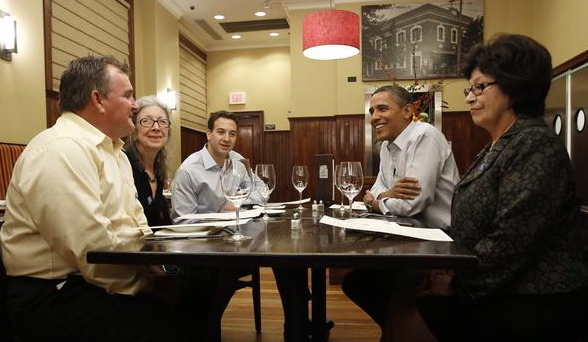 Above, the final 52-second video is a teaser, billed as "Video Preview: Dinner with Barack." The President talks about the challenges of trick-or-treating in public with his daughters, now that he's Commander in Chief. Last time he "pulled it off," Mr. Obama said, was in 2007. The President will dine at a later date with four more donors from the Campaign's second contest, the "Dinner with Barack II" sweepstakes, held during fundraising quarter 3, July-September. The winners' names have not yet been released. In an interview in September, Campaign Deputy Press Secretary Katie Hogan told Obama Foodorama that there was no way to determine how many donors have actually given money in order to be entered in the dinner contests; she said that donations for the dinner contests were not specifically tracked, which seems hard to believe. Donors for the second and third contests were and are automatically entered into the dinner pool, but that was not the case for the first dinner contest. Entering the contests without donating is/was possible, too. The third contest closes on December 31, and will have three winners, each of whom can bring a guest. The Campaign is already heavily promoting the third dinner contest, and this week sent a Thanksgiving e-mail to woo donors. 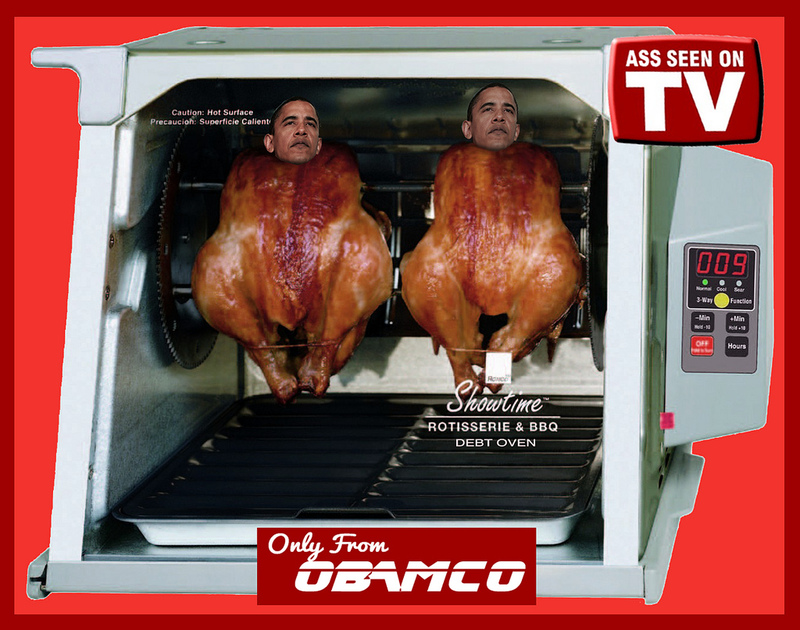 read more "Dinner with Barack: The Mini Movies"
Combining Black Friday and its ongoing criticism of President Obama's economic policy, the widely read Zero Hedge has posted this bit of anti-Presidential food art. The "Rotisserie & BBQ Debt Oven" featuring President Obama's head on two turkeys was posted under the title "Walmart After Christmas Price Riot!" 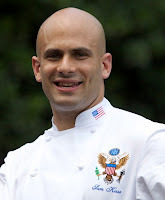 The Obama image was part of a larger tableau contributed by "williambanzai7," and also included an image of Jon Corzine as a chef hawking lids, and Lloyd Blankfein hawking a "slice-o-matic." read more "Roasting Obama Economic Policy"
It was a good post-Thanksgiving Saturday for the Hoops Lover in Chief: President Obama began the day with the news that the 149-day NBA lockout will end, played basketball with personal aide Reggie Love, then traveled to Maryland to watch as the Oregon State Beavers defeated the Towson University Tigers, 66-46. Oregon State, of course, is coached by First Lady Michelle Obama's brother Craig Robinson, and the entire First Family was on hand to witness the victory. 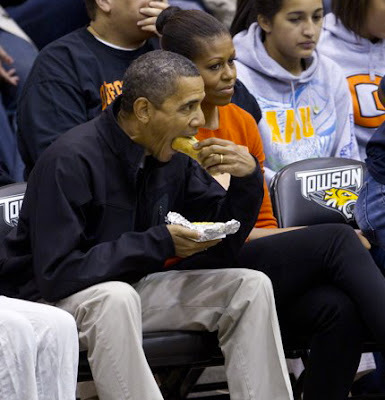 President Obama enjoyed a hot dog and bottled water during the second half of the game, sitting beside his wife, who was clad in an orange sweater and black pants, in honor of Oregon State's team colors (above). Obama daughters Malia and Sasha were also clad in team colors as the First Family entered the Towson basketball arena at 1:40 PM, to a standing ovation from the crowd. The Obamas shook hands with folks in the stands and took their courtside seats, opposite the Oregon State bench. Before the tip-off, legendary actor-comedian Bill Murray, on hand for the game, stopped by to greet the First Couple (above). As the Oregon State team was introduced, the President and Mrs. Obama smiled broadly and clapped a bit louder when Coach Robinson’s name was called out. The Oregon State hoopsters on Wednesday joined the First Family as they packed groceries at the Capital Area Food Bank, for a Thanksgiving community service event. Earlier in the day, after playing basketball with personal aide Reggie Love at Fort McNair, President Obama was asked about the end of the NBA lockout. At halftime, the Towson football team was introduced. The Tigers won the Colonial Athletic Association championship this season and are now competing in the FCS playoffs. The players posed for a photo with the President. Swarming around him, the team was warned they’d have to run laps if they didn’t give him some room. By 4:02 PM, victory accomplished, the President and First Lady were airborne in Marine One, heading back to the White House from the Baltimore area. Daughters Malia and Sasha traveled separately, according to pool. 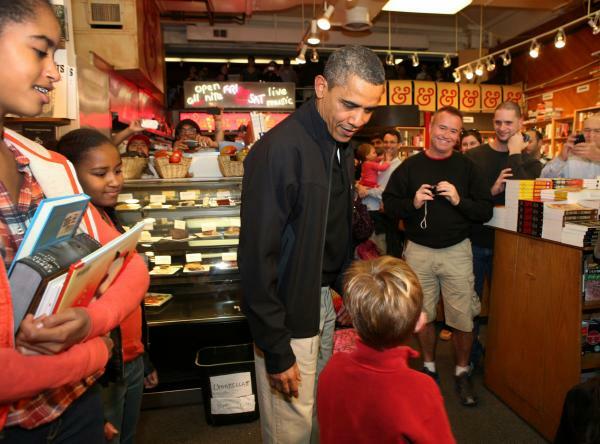 Before heading to Maryland, the President and his daughters visited Kramerbooks & Afterwords Cafe in Washington, DC, for Small Business Saturday. 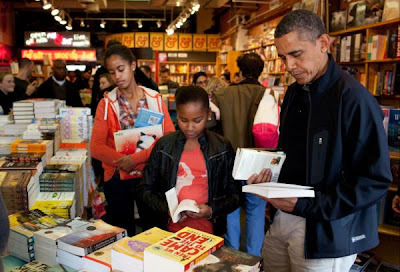 read more "College Hoops & A Hot Dog"
To support "Small Business Saturday," President Obama this morning did some Christmas shopping, browsing the literary offerings at Washington, DC's Kramerbooks & Afterwords Cafe, accompanied by daughters Malia and Sasha. The popular bookstore and cafe, located in Dupont Circle, has been open since 1976. "You doing some Christmas shopping? Not yet?" 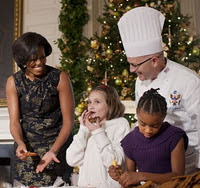 President Obama asked a boy named Alexander, whom he greeted by the bakery case (above, as Malia and Sasha look on). "Well, we're starting early. This is Small Business Saturday. So we're out here supporting small business." The event to encourage support of independently owned businesses was sponsored by some very large corporations: American Express, FedEx, Google, and Facebook, among others. Small businesses create one in three jobs in America, according to the Administration. The President arrived at 11:36 AM, and spent about 20 minutes with his daughters at the store. The President began his Saturday with a rousing game of hoops in the gym at Ft. McNair, joined by personal aide Reggie Love, who will depart the White House by the end of the year. "We're sad to see Reggie go," President Obama told his press pool, when queried. "But he's doing the right thing. He's going to finish his education and as you can see we're still getting a little basketball in." The President's motorcade was back at the White House by 11:57 AM. 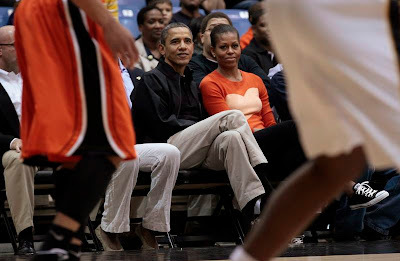 In the afternoon, the First Family traveled to Towson University, to watch First Brother-in-Law Craig Robinson's Oregon State Beavers trump the Towson Tigers 66-46, in a hoops match up. Info: Kramerbooks & Afterwords Cafe is at 1517 Conn. Avenue, NW, Washington, DC 20036. Phone: (202) 387-1400.
read more "Small Business Saturday: President Obama Visits Kramerbooks & Afterwords Cafe"
What If The Kitchen Garden Had Failed? Happy Birthday, Vice President Joe Biden! No More Cake For Federal Employees? Preview: First Lady Michelle Obama On "iCarly"
Pollan in Forbes: First Lady Michelle Obama Is "World's Most Powerful Foodie"